Luke, Zac and I took Teleroo to Innovation in the Wild, hosted by the German Chamber of Commerce and The Cluster. We showcased Teleroo to 36 people from the German Chamber of Commerce. They rotated through 12 companies exhibiting in groups of 3. 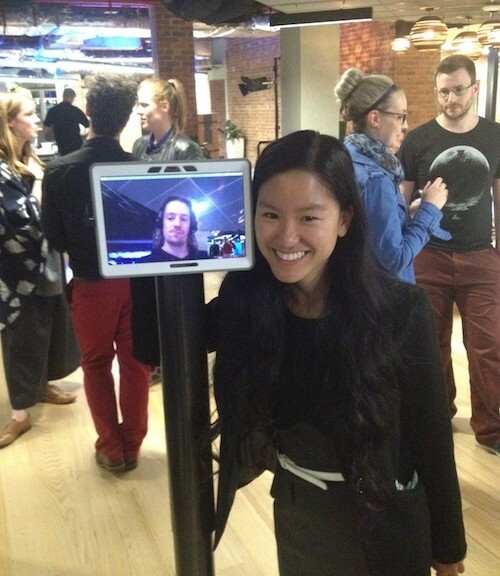 It was very fun to share our Teleroo only 30 hours after returning from Singularity University. And telling the same story over and over again helped us refine our pitch. My friend invited me to show off Teleroo at Telstra. So I spoke about Jeva, Teleroo, Singularity University and computer vision. Following that Zac, Garth and I gave demonstrations of Teleroo and let people move around. Everyone really enjoyed playing with Teleroo. Here I am with Teleroo at the Telstra event. Smiles all around! Here is Teleroo staking out the scene, looking for people to talk to. And this is Teleroo surveying the audience while I was talking on stage. FYA CEO and 2012 Westpac Most Influential Woman in Australia, Jan Owen, Marita and Teleroo posing in front of the Unleashed registration tent at Federation Square.